Built In: 8th Century A.D.
» Take a tour of Vrindavan. Contact us. Where is Vrindavan : Vrindavana is 135 km south of Delhi and 55 km north of Agra, just off the Delhi-Agra Road. It is 12 km or a 25-minute auto-rickshaw ride from Mathura. It has a small-town type atmosphere with narrow streets and not much motor traffic. There are said to be over 5000 temples in Vrindavana. Vrindavan Tourism The four Vrindavan temples that were built in honour of his visit are Govind Deva, Madan Mohan, Gopinath, and Jugal Kishore. The first is an impressive edifice built in red sandstone. Architecturally this temple is one of the finest in North India. However, apart from its history, what keeps Vrindavan darshan alive in the popular imagination of the people is its rich legend and mythology. Vrindavan is considered the place where Lord Krishna spent his early childhood. It was here that Krishna indulged in adolescent pranks with the gopis (milkmaids) in the forests and stealing their clothes while they bathed in the river. 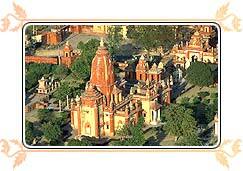 On travel Vrindavan discover the renownned Isckon temple. HARE RAMA HARE KRISHNA, this name is probably amongst the first things that spring to a westerner's mind when one thinks of India or the spirituality connected to it. A.C. Bhaktivedanta Swami Prabhupada (also known as Srila Prabhupada) established the movement officially known as the International Society for Krishna Consciousness (ISKCON) in 1966. The society has since developed into a worldwide confederation of 6,000 temple devotees and 190,000 congregational devotees. It comprises of more than 350 centers, 60 rural communities, 50 schools and 60 restaurants spread all across the globe. The aim of the society is to "promote the well being of society by teaching the science of Krishna consciousness according to the Bhagavad-Gita and other ancient Vedic scriptures of India." Visit Vrindavan temple you can see the Radha-Vinod Deities of Lokanath Goswami, Radha-Gokulananda Deities of Viswanath Cakravarti, Caitanya Mahaprabhu Deity of Narottama Dasa Thakur, Vijaya Govinda Deities of Baladeva Vidyabhushana, and the Govardhana-shila given by Lord Caitanya to Raghunath Dasa Goswami. The samadhis of Lokanath Goswami, Narottama Dasa, and Viswanath Cakravarti are in front of the temple. Viswanath Cakravarti arranged to have this temple built. Gopinathji was originally installed in Vrindavana by Vajranabha, the great grandson of Krishnaa. When the Muslims raided Vrindavana, the original Gopinath Deity was taken to Jaipur. The Gopinath Deity in Jaipur and Lord Krishna are said to exactly resemble each other from Their shoulders down to the waist. On Vrindavan trip visit Radha-Syamasundara Temple. These are the Deities of Syamananda Prabhu. Darshan is from 8.30 to 11 am and 5 to 8 pm. It is one of the seven major temples in Vrindavana. Syamananda's samadhi is across the street and down from the entrance of the temple. Other the other places to visit in Vrindavan comes Imli Tala. Sri Caitanya Mahaprabhu would come daily to Imli Tala to chant japa, when He was living in Vrindavana. Imli Tala means the shade of the tamarind tree. Imli means 'tamarind' and tala mean 'tree'. There is a small temple here with Gaura-Nitai and Radha-Krishna Deities. It is customary for devotees to walk around the town of Mridul Vrindhavana dham. There is a parikrama path that goes around the town. This path is one street over from the ISKCON temple. It takes two or three hours to go around the town.You can also contact us for Vrindavan Hotels bookings. Though Vrindavan itself is a railway station, the major railway station nearby is Mathura on the Delhi-Chennai and Delhi-Mumbai main line. Several express trains connect Mathura from other major cities of India like Delhi, Mumbai, Chennai, Bangalore, Calcutta, and Agra. Three local trains leave Mathura Junction each day (6.30 am, 3.40 pm & 7.40 pm) for the station in the south of Vrindavan. Vrindavan is connected to Mathura and all other places of interest in Braj by bus services and is on direct road link from Delhi and Agra. Getting to Vrindavan from Mathura is very easy as there are frequent buses, shared tempos, and taxis available throughout the day.